If you have recently started learning PLC programming and has already understand the concept of choosing right type of PLC for any project, then it's now time to know about concept of Source and Sink in PLC. Understanding when PLC is connected as source and when as sink is very important for all the Automation engineers. Connecting a power supply to input or output of a PLC makes it input source or input sink and output source or output sink. So source and sink totally depends on how you connect your power supply. Subscribe to Automation-Talk by Email. 1. Sink Type: In a sink type, current always flow into the PLC and positive (+ve) of supply is connected to PLC input terminal (In case you are making your input as sink) and Negative (-ve) of supply is connected to common in Input module of PLC as shown below. Remember the basic electrical theory, that current always flow from positive to negative. You can also memorize this by taking example of a water sink, where water flows to sink hole. 2. 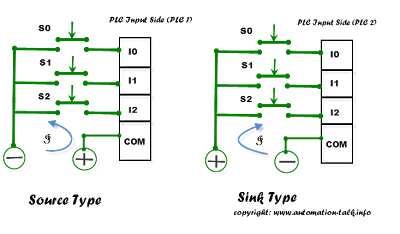 Source Type: In a source type, current always flow from PLC to external device such as switch or sensor as shown above. Here all the input of PLC are connected to negative (-ve) of supply and Common of Input module is connected to positive (+ve). In the above image, we have taken example of Input side of PLC, here we have taken 2 PLC in source and sink configuration. 1. 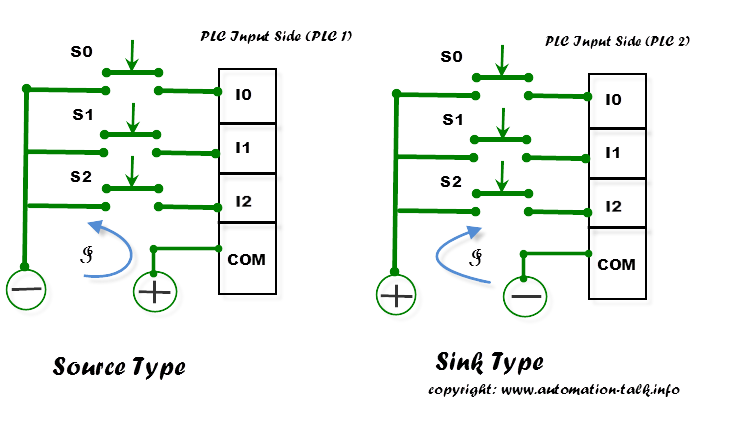 Here S0, S1, S2 are switches. 3. "I" is the current and blue line is showing direction of current. 4. Positive (+ve) and negative (-ve) are terminal of power supply. Note: Never confuse while connecting a NPN type PLC with NPN sensor or PNP PLC with PNP sensor. The above explanation of Source and Sink was done considering Input side of PLC and same is true for output side of PLC. If you have any other question or query please feel free to leave your comments. If you like our article consider it sharing. I have read exact opposite of this for mitsubishi PLC. 24V is made common for sink input type and 0V for source input type.